At the end of day, integrity and results is what drives our company forward. But it is the passion we feel toward philanthropy and supporting others that fuels our desire to be the best we can be. Forest Contractors and the Gurrerri family strongly believe in corporate social responsibility as dedicated members of society. 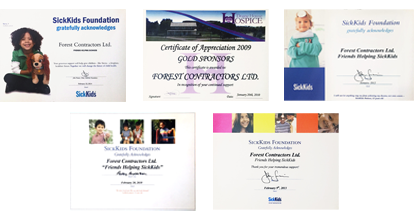 Over the years, we have remained true to our commitment of supporting various charitable causes to make a difference in the lives of those in need. Our annual Friends of the Hospital for Sick Children gala continues to cap off our year while successfully raising thousands of dollars for cancer research and family services — a cause our family holds dear to its heart. There is no greater joy than seeing the smiles on the faces of children as we lend our hearts to the SickKids Foundation.